Head to Via Condotti and Officine Creative Romafor some retail therapy. Get some historical perspective at Palatine Hill and Piazza Navona. The adventure continues: explore the ancient world of Colosseum, wander the streets of Trastevere, pause for some serene contemplation at Church of St. Louis of the French, and don't miss a visit to St. Peter's Basilica. Cairo, Egypt to Rome is an approximately 7-hour flight. You can also drive. You'll gain 1 hour traveling from Cairo to Rome due to the time zone difference. Expect little chillier temperatures when traveling from Cairo in April; daily highs in Rome reach 24°C and lows reach 11°C. On the 8th (Mon), you'll have the morning to explore before heading off to Florence. Explore hidden gems such as Basilica San Miniato al Monte and Chianti Cashmere Goat Farm. 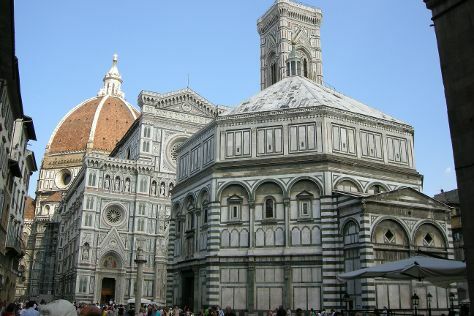 Cathedral of Santa Maria del Fiore and Uffizi Galleries are good opportunities to explore the local culture. Venture out of the city with trips to Fattoria Casaloste (in Panzano in Chianti), Basile Azienda Agricola Biologica (in Cinigiano) and Rocca di Montemassi (in Montemassi). There's lots more to do: see the interesting displays at Galleria dell'Accademia, do a tasting at Poggio Rubino, experience rural life at Castello di Verrazzano, and see the top attractions with Castello Romitorio. For reviews, maps, photos, and tourist information, refer to the Florence visit planning site . Getting from Rome to Florence by train takes about 2 hours. Other options: drive; or fly. April in Florence sees daily highs of 22°C and lows of 11°C at night. Wrap up your sightseeing on the 12th (Fri) early enough to take a train to Verona. On the 13th (Sat), contemplate in the serene atmosphere at Basilica di Sant'Andrea di Mantova, step into the grandiose world of Palazzo Ducale Mantova, then Head underground at Museo di Palazzo Ducale., then take a stroll through Piazza delle Erbe, and finally experience the emotional art of opera at Arena di Verona. Get ready for a full day of sightseeing on the next day: head outdoors with King Rock arrampicata, then take in the architecture and atmosphere at Chiesa di Sant'Anastasia, then take in the spiritual surroundings of Basilica di San Zeno Maggiore, and finally explore the historical opulence of Rocca Scaligera di Sirmione. 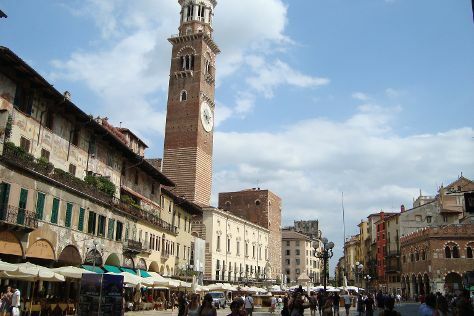 To find more things to do, other places to visit, photos, and tourist information, go to the Verona online itinerary planner . Traveling by train from Florence to Verona takes 2 hours. Alternatively, you can drive; or take a bus. Expect a daytime high around 23°C in April, and nighttime lows around 9°C. Finish your sightseeing early on the 15th (Mon) so you can take a train to Venice. Give yourself a bit of retail therapy at BrAgora and Gioielleria Eredi Jovon. Do some cultural sightseeing at Basilica di San Marco and Cannaregio. There's lots more to do: explore the activities along Canal Grande, pause for some serene contemplation at San Giorgio Maggiore, don't miss a visit to Peggy Guggenheim Collection, and admire the landmark architecture of Doge's Palace. Find out how to plan Venice trip without stress by asking Inspirock to help create an itinerary. You can take a train from Verona to Venice in 1.5 hours. Alternatively, you can drive; or take a bus. In April, daily temperatures in Venice can reach 21°C, while at night they dip to 11°C. Cap off your sightseeing on the 18th (Thu) early enough to travel back home.